John Lewis announced last week that it would work with Microsoft to bring retail availability to the UK for Surface tablets running Windows RT. The devices have previously been showing as available online through the website even though Sat 15th was said to be when the devices would be widely distributed. Microsoft has to date only been selling the devices through its own online store here in the UK even though it has been promoting the tablets on TV and through billboard advertising. Today marks the first store appearance for Microsoft’s Windows RT tablet. Taking Front Page on John Lewis Web Store.. The Microsoft Surface is the first computer produced from the software giant and marks a radical new direction for the company. They have stated they want to become a Devices and Services Company and the Surface Tablet is the first step towards that goal. This is just the start and more device set to appear later. Microsoft do have a bricks and mortar presence in the Americas but elsewhere they have yet to set up shop. This has meant that the tablets were initially only available online and difficult for the consumer to physically evaluate, when committing this much money to a purchase a 'hands on' is a must. John Lewis is a well trusted department store here in the UK and it is with some relief that they are the first to take on the device. Their staff are knowledgeable and selection of products is well chosen unlike some of the other retailers we could, but won’t mention. Today has seen the stock of the Surface arrive and the department store will carry both the 32GB and the 64GB devices.. They have also taken the step of offering the devices only with the touch-cover instead of providing it as an optional extra. If you wish to buy the surface without the Touch Cover then you’ll need to head back to the Microsoft Online Store for the Vanilla option. 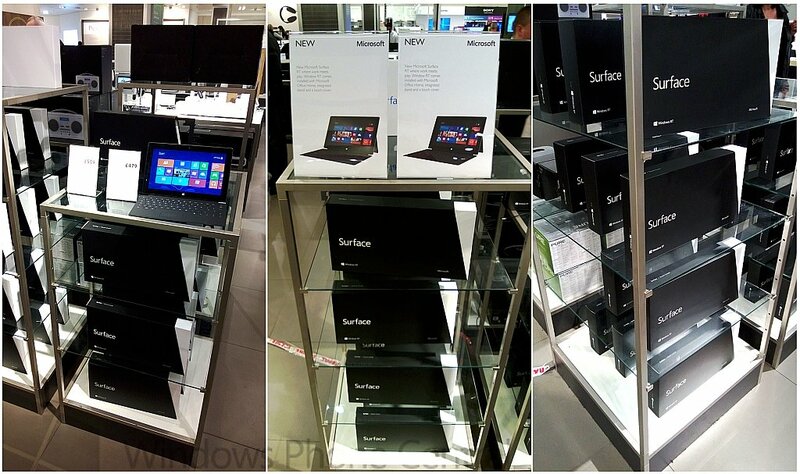 In store the devices have been put on a separate stand away from the tablets and the laptops, the Surface boxes are stacked up with a demo unit on display. Initial interest in the device looks to be good with the quick take we did in store. The staff were able to answer questions about the included Office Suite and the Marketplace for apps. The devices had just gone onto display when we turned up and customers seemed interested in the tablets. Now that these tablets running Windows RT are now available to actually compare and contrast in stores here in the UK we will be following how they do very closely. We have yet to find out if Microsoft and John Lewis will partner on further advertising to make the public aware of the availability. The Surface is certainly the best known of all the Windows 8 machines and offers tablet like battery performance. What will consumers make of it when they compare to the Android Tablets and the mighty iPad? 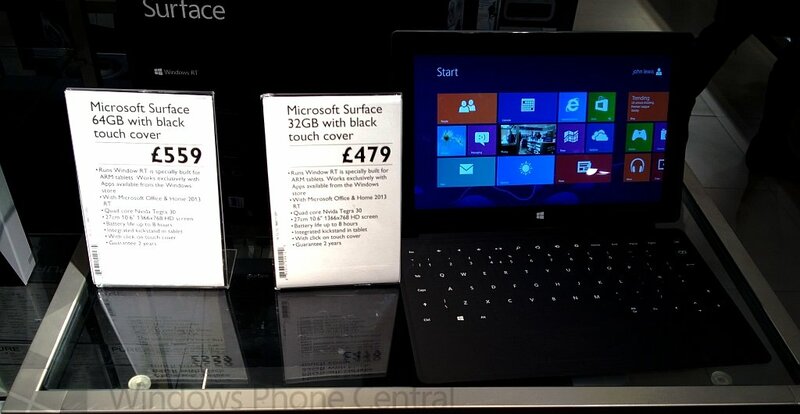 John Lewis will sell the 64GB Surface with Black Touch Cover for £559.00 while the 32GB version will go for £479 with the Black Touch Cover. If you live in the UK we’d like to hear from you, are you planning on checking out the Surface? If you do pop into a store let us know what your experience was like. Comments are open.